While China’s policy in Africa during the Xi Jinping era will look much like that of the Hu Jintao period, the challenges will be greater. Recently installed Chinese President Xi Jinping made his first visit outside the country to Russia and then went directly to Tanzania before he attends the BRICS summit in Durban, South Africa, followed by a state visit to that country. Xi Jinping will end this international travel with a stop in the Republic of the Congo. The fact that Xi Jinping is devoting so much time so early in his tenure to Africa underscores a continuing theme in Chinese foreign policy. China frequently points out that it is the world’s largest developing country (the “developing” assertion is open to debate) and Africa is the location of the world’s largest number of developing countries. China sees its future as intertwined with the world’s developing countries. Fifty of Africa’s 54 countries now recognize China while four still recognize Taiwan. China has an embassy in all 50 except for Somalia. China passed the United States in 2009 as Africa’s largest trading partner. It is providing an estimated $2.5 billion annually in OECD-equivalent foreign aid to Africa as compared to $8 billion from the United States. While China’s cumulative investment in Africa lags that from the United States, which started earlier, it has probably been greater in recent years than that originating in the United States. Washington has more extensive security interests, including a military base in Djibouti with more than 3,000 personnel, in Africa than does Beijing. On the other hand, China has 1,500 military and police personnel assigned to six of the seven UN peacekeeping missions in Africa compared to less than 30 from the United States. China now offers about 5,000 fully paid scholarships annually to African students to study in China and has provided technical training for some 30,000 Africans. Since 1963, more than 18,000 Chinese medical personnel have served in 46 African countries. Several years ago, China began sending to Africa small numbers of youth volunteers in a program that is similar to the much larger U.S. Peace Corps. Its official news agency, Xinhua, has more than 20 bureaus in Africa and China Radio International and China Central Television are rapidly expanding their presence in Africa. China has 29 Confucius Institutes, which teach Chinese language and culture, in 22 African countries. Over the past two decades China has significantly stepped up its efforts in Africa and this will continue under Xi Jinping’s leadership. While China casts the relationship as part of its “win-win” strategy for helping to develop the continent, the picture is more complicated. Like all countries, China is operating in its own interests and it has at least four of them in Africa. First, it needs access to African raw materials, especially energy and minerals, to fuel its strong industrial economy. The continuing success of this economy helps ensure that the Communist Party of China remains in power. Second, China relies on the political support of its African friends in international forums such as the United Nations and World Trade Organization. Third, Beijing seeks eventually to replace Taipei in those four countries that continue to recognize Taiwan. Fourth, China grasped sooner than the United States that Africa’s more than one billion people and growing middle class offer an attractive market for its exports. 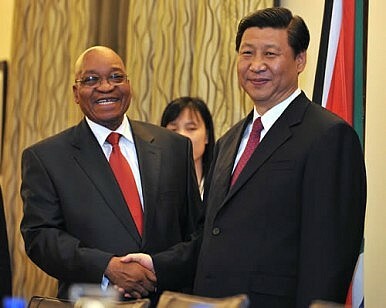 Xi Jinping will continue to pursue these interests in Africa and almost certainly increase efforts to strengthen ties with individual African countries and African regional organizations such as the African Union, Economic Community of West African States, Southern African Development Community, and Common Market for Eastern and Southern Africa. In 2000, China established the Forum on China Africa Cooperation, which meets at the summit level every three years, to help coordinate this rapidly expanding engagement. China is committed to Africa for the long-term. China's aid strategy contradicts the Western approach, but is arguably more effective in achieving development goals.